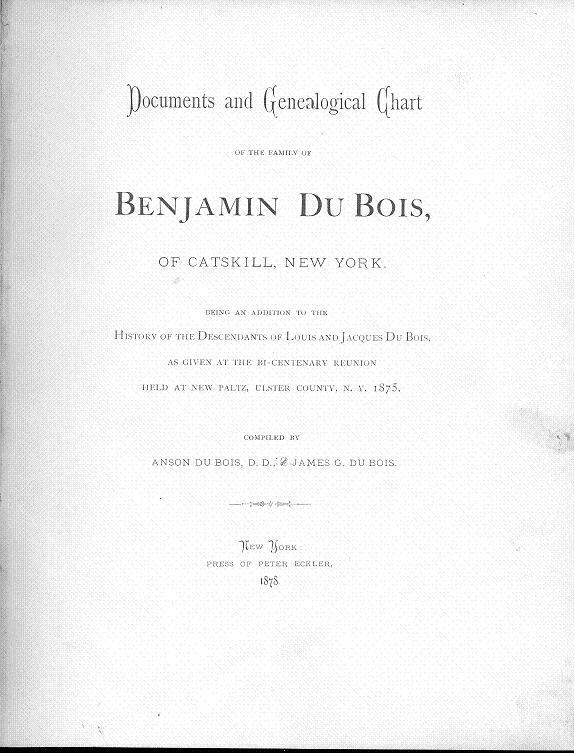 The book, Documents and Genealogical Chart of the family of Benjamin Du Bois of Catskill, New York, being an addition to the History of the Descendants of Louis and Jacques Du Bois as given at the Bi-Centenary Reunion held at New Paltz, Ulster County, N.Y. 1875." It was compiled by Anson Du Bois, D.D. & James Du Boise. It was printed at the Press of Peter Eckler in New York, New York in 1878. Please note: This is not a paper book, it is a scan of the original paper book into the digital Adobe PDF format, written on a CD-ROM. You read this book on your computer using the free Adobe Reader software. It is a digital version of a hard to find book. If you could find a copy of the 1878 printed book, it would be very expensive. 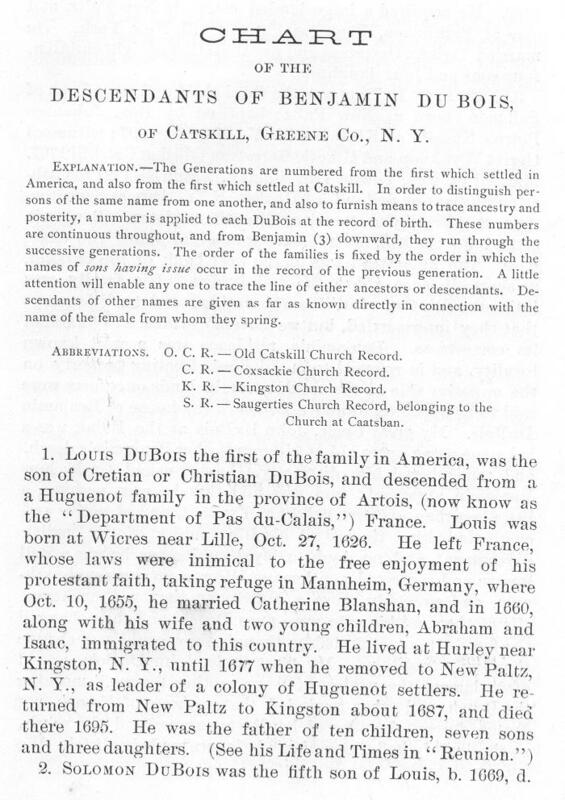 This book is FULL of genealogical information about the Du Bois (Dubois) family and allied families from the Catskill area (Ulster County) of New York state from approximately 1626 to the year of publication, 1878. It also has a few annotated notes by previous owners (corrected name, birth date, etc). I wish this was my family  it would greatly simplify my research and probably correct a number of mistakes. I have compared this to some genealogical posts on web sites for the Dubois family name and it looks like there are some differences. As this was written/compiled by Du Bois family members in 1875-1878, I would assume that they actually talked to a number of the individuals living at the time  and that their information is probably first hand. 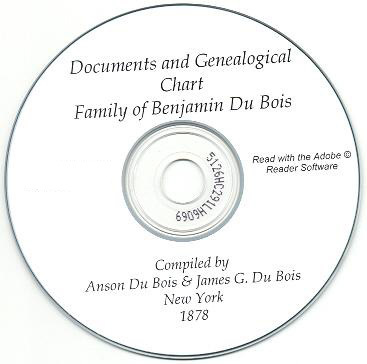 Though the title of the book indicates it is on the family of Benjamin Du Bois, the genealogical chart starts with the original immigrant Louis (or Louys) Du Bois. Louis and his wife Catherine Blanshan came to America from France (via Germany where he married Catherine) in 1660. Half the book is composed of copies/transcriptions of deeds, land grants, wills, and other documents concerning the Du Boise and other persons, including American Indians. There are a lot of data concerning persons who married into the Du Bois clan. Of great interest as well are some data on American Indians who sold the original land to Europeans in 1682. 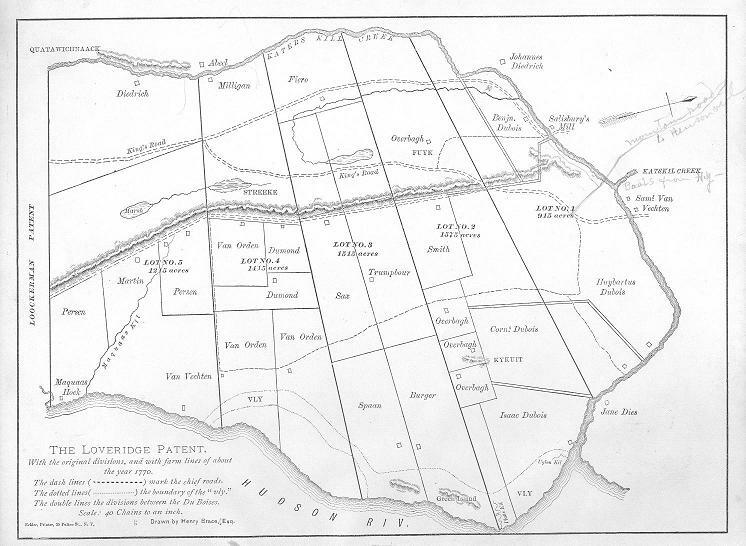 These Native Americans (Indians) are referred to by name in a transcription of the original deed and again in a patent of land ownership dated 1686 from the County of Albany government. 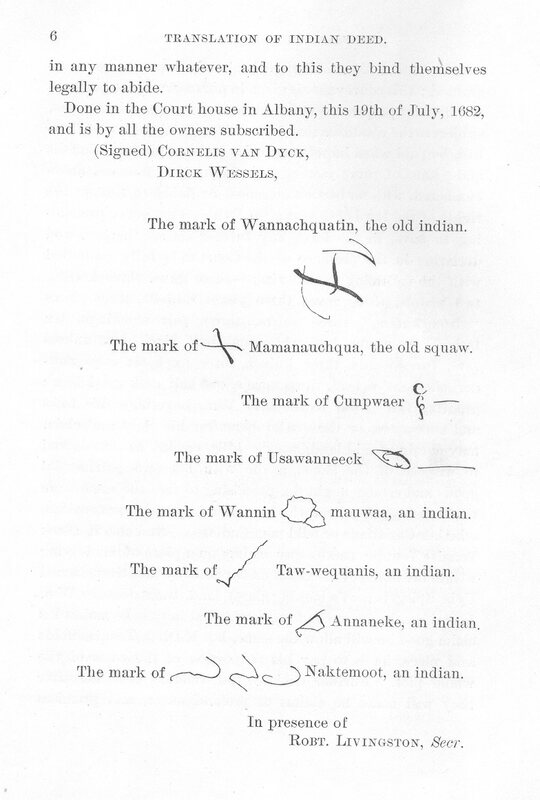 The deed transcription (in the original Dutch and again in English) also illustrate the Indians marks, as they were illiterate. I will list here all of the documents, illustrations, and names included in the original Table of Contents/Index. The book is fully indexed and the index is linked with the Adobe Reader hyperlinks. Du Bois (Dubois) Names: Abraham Du Bois, Achie Du Bois, Addison Du Bois, Addie Du Bois, Agnes Du Bois, Alfred Du Bois (2 each), Alice Du Bois, Andreas Du Bois, Ann Jeanette Du Bois, Anna Jeanette Du Bois, Annaetje Du Bois (2), Annie Du Bois, Anson Du Bois, Arreyaentje Du Bois, Arthur Du Bois, Augusta Du Bois, Augustus R. Du Bois, Augustus Edwin Du Bois, Barent Du Bois (4), Benjamin Du Bois (5), Benjamin I. Du Bois, Benjamin P. Du Bois, Bertha Francis Du Bois, Caroline Du Bois, Caroline Elizabeth Du Bois, Caroline Foster Du Bois, Caroline Gertrude Du Bois, Caty Du Bois (2), Catherine Du Bois (8), Catherine Elizabeth Du Bois, Catherine G. Du Bois, Catelintje Du Bois, Charles Du Bois, Charles Rodgers Du Bois, Charlotte Isabella Du Bois, Christian Du Bois, Cornelia Du Bois, Cornelius Du Bois (5), Edith Gertrude Du Bois, Edward Lyon Du Bois, Edwin Du Bois, Eitie Du Bois, Eleanor Du Bois, Eliza Du Bois, Eliza Jane Du Bois, Elizabeth Du Bois (3), Elizabeth Hunt Du Bois, Ellen Du Bois, Emily Ann Du Bois, Emma Du Bois, Esther Du Bois (2), Frank Du Bois (3), Francis Wynkoop Du Bois, Frederick Du Bois, Frederick Hopkins Du Bois, Frederick Nelson Du Bois, Geertrey Du Bois (2), Genevieve Larremore Du Bois, George Du Bois, Gertrude Du Bois (2), Gilbert Du Bois, Grant Du Bois, Harriet Du Bois, Helena Du Bois, Hendricus Du Bois, Henry Du Bois, Henry A. Du Bois, Henry Clay Du Bois, Henry Grant Du Bois, Henry Reynolds Du Bois, Hunter Du Bois, Huybartus Du Bois, Isaac Du Bois (3), Isaac J. Du Bois, Ira Du Bois (3), Ira Francis Du Bois, Jacomeuntje Du Bois, James Du Bois (2), James B. Du Bois, James G. Du Bois, James Oscar Du Bois, Jane Du Bois, Jennette Du Bois (3), Jennie Du Bois, Joel Du Bois (2), John Du Bois (3), John D. Du Bois, John P. Du Bois, Jonathan Du Bois, Joseph Allen Du Bois, Joseph Allen Du Bois Jr., Julia Allen Du Bois, Julia Canniff Du Bois, Julius Anson Du Bois, Lana Du Bois, Lannah Du Bois (2), Lewis Du Bois, Lewis J. Du Bois, Lidia Du Bois, Louis Du Bois (3), Louis Anson Du Bois, Louys Du Bois, Lowrens Du Bois, Lyman Du Bois, Magdalena Du Bois, Margaret Du Bois (2), Margaret E. Du Bois, Margery Du Bois, Margrettje Du Bois, Maria Du Bois (2), Martha Jane Du Bois, Mary Allen Du Bois, Mary C. Du Bois, Mary Catherine Du Bois, Mary Gertrude Du Bois (2), Nancie Du Bois, Nancy Du Bois, Nancy Rodgers Du Bois, Neeltje Du Bois, Nathaniel Hunter Du Bois, Percy Maltby Du Bois, Peter Du Bois (2), Peter Goelet Du Bois, Peter Grant Du Bois, Philo Du Bois, Rachel Du Bois (3), Rebecca Du Bois, Rhoda Du Bois, Robert Dodge Du Bois, Robert McKerty Du Bois, Sally Du Bois, Samuel Du Bois (3), Samuel Barent Du Bois, Sara Du Bois, Sarah Du Bois (3), Solomon Du Bois (3), Stella Du Bois, Susie Du Bois, Treintje Du Bois, Tuthill Du Bois, Warren Du Bois, William Du Bois (4), William Florence Du Bois, William Larremore Du Bois. Other Names: Archibald Hunter Abeel, Anthony Abeel, Catherine Abeel, Cornelius M. Abeel, Elizabeth Abeel, Emily Du Bois Abeel, Francis Hunter Abeel, Garret N. Abeel, Catherine Addison, Sarah A. Allen, Gertrude Ashley, Marcia Ashley, Oliver Ashley, Abner Austin, James Barker, David Becker, Libbie Becker, Lewis Bennen, Teunis G. Bergen, Abraham Bogardus, Betsey Bogardus, Caty Bogardus, Egbert Bogardus, Hannah Bogardus, Jacob Bogardus, Jacobus Bogardus, James Bogardus, Jenette Bogardus, John Bogardus, Lannah Bogardus, Peter Bogardus, Sally Bogardus, Samuel Bogardus, Henry Brace, Frederick Brandow, Catherine Bronk, Eliza Brower, Abraham Burgett, Emaline Demarest Burgett, James Romeyn Burgett, Annie Burke, Ira Canefield, Phebe Canniff, Arraetta Carle, Le Grand Carle, Marion Helen Carle, James Cater, William Cater, Abraham Gaasbeck Chambers, William Chapel, Elbert Gerberts Chrimffe, Zara Crispel, John Crook, John Cowell, Isaac C. Dart, Jeannette Fairmain Davis, Frederick Diederick, Carrie Burgett De La Mater, Ella Louisa De La Mater, R. G. De La Mater, William Dean De La Mater, Capt. Delavan, John Depeyster, Lambertus De Ronde, Horatio Dewey, Caty Dies, Jane Dies, Jennette Dies, John Dies, Nancy Gertrude Dodd, Spencer Carter Dodd, Thomas Dodd, Thomas Grant Dodd, Maria Jane Illiard Dodge, George J. L. Doll, John M. Donnelly, Thomas Dongan, Robert Dorlan, Carl Du Bois Eckler, H. S. Eckler, Louisa C. Eckler, Morris Du Bois Eckler, Neeltje Du Bois Eckler, Peter Eckler, Peter Morris Eckler, Willie Morris Eckler, Abraham Elmendorf, Annaetje Elmendorf, Huybartus Du Bois Elmendorf, Jacob Elmendorf, Jan Eltinge, Josiah Eltinge, Noah Eltinge, Austin W. Fay, Joel Du Bois Fay, Nancy Ann Fay, Serepta Catherine Fay, Thomas Fay, Thomas Addison Fay, Warren Fay, Margrietjen Felton, Christian Fiero, Abram Fonda, Isaac Fonda, Jacob Fonda, Lannah Fonda, Capt. Fowler, John French, Johannes Casperus Freyenmoet, H. D. Ganse, Hemans Gansefort, Jane C. Goelet, James Goelet, Adelade J. Goodwin, Clarissa Goodwin, James Graham, Jennie Grant, Jacob R. Greene, William Marius Grom, Hannah Hall, Cornelia Hallenbeck, Jacob M. Hallenbeck, Joseph Hasbrouck, Charlotte Russel Hatch, Gertrude Walters Hatch, Harvey Du Bois Hatch, Henry W. Hatch, Stella Tracey Hatch, Elizabeth B. Hartman, Clara Louisa Hefford, Robert R. Hefford, Gare Hermann, Gosie Hermanee, John Hermanee, Lannah Hermanee, Polly Hermanee, Rachel Jane Hermanee, Frank Hodge, Frank Hodge Jr., Homer Hodge, Brogan Hoff, Abraham Hoffman, Abraham Hoffman Jr., Addison Hoffman, Antoni Hoffman, Cornelia Catherine Hoffman, Huybartus Hoffman, Marthen Hoffman, Martinus Hoffman, Debbie C. Hommell, Catherine Hoogteling, John R. Hunt, Agnes Conover Hunter, Archibald Hunter, Catherine Hunter, Charles Du Bois Hunter, David Moore Hunter, Francis Henrietta Hunter, George Conover Hunter, Jennette Hunter, Joel Du Bois Hunter, Lana Hunter, Mary Frances Hunter, Nathaniel Hunter, Robert Joseph Hunter, Sally Jane Hunter, Walter Livingston Hunter, William Hunter, Henry Jansen, Agnes Kelley, Dorrance Kirtland, Peter Lanbagh, Gisbert Lane, Hannah Lane, Abram G. Lansing, Catherine Larremore, Jean Leeg, Abraham Lewis, Emma A. Lewis, Gertrude Du Boise Lewis, Harriet Amanda Lewis, Homer Agustus Lewis, James Grant Lewis, Jennie Lewis, Larremore Lewis, Levy Stevens Lewis, Howard Linzey, William Linzey, Robert Livingston, Temperance Loveridge, William Loveridge, William Loveridge Jr., Peter Lowe, Alexander MacDowell (MacDowall), Margaret MacDowell, Elizabeth Mackey, Du Bois Mallory, Gitty Malory, John Mallory, Nancy Mallory, George Wilhelmus Maneius, Fannie Esther Manning, James Du Bois Manning, John Manning, John Augustus Manning, Judson Waterbury Manning, Kate Stanton Manning, Mary Josephine Manning, Melville Manning, John E. Mills, Amelia Elizabeth Mitchell, Henry Moore, Richard Nicolls, Johannes Petrus Nucella, Theunis Oostrander, Benjamin Overbagh, Catherine Overbagh, Cathreyntje Overbagh, Christian Overbagh, Jerry Overbagh, Johan Jurry Overbagh, Johannis Overbagh, John Overbagh, Jurion Overbagh, Margaret Overbagh, Maria Overbagh, Peter Overbagh, Petrus Overbagh, Rebecca Overbagh, Sarah Overbagh, Jonathan Palen, Theodore Palen, Michael Phillips, James D. Pickney, Thomas E. Proctor, John Putnum, Isaac Race, John H. Ranny, Elbert Reed, Helen A. Reiley, Rebecca Riley, Mary Rodgers, John Ross, Mary Ryan, Lana Sammons, Margaret Sammons Margriet Sammons, Abraham Salisbury, Capt. Barrant Staats Salisbury, Catherine Salisbury, Catilena Salisbury, Ebellena Salisbury, Edward Larremore Salisbury, Franklin Salisbury, Helen Salisbury, Marytje Salisbury, Rachel Salisbury, Sara Salisbury, Staats Salisbury, Sylvester Salisbury, Treintje Salisbury, Wiljem Salisbury, Gen. William Salisbury, William B. Salisbury, Robert Sanders, Anna Sanford, Charles Le Grand Sax, Garetta Sax, George Sax, George Sax Jr., Ira Sax, Johannes Scheunemann, Dirck Schepmoes, Jane Schut, John V. D. S. Scott, Peter Shaurman, Martin Shuster, Paulus Smith, Huybartus Du Bois Sole, Jolm Sole, Rachel Jane Sole, Robert Sole, Albert G. Stanton, Carrie Du Bois Stanton, Eleanor S. Stanton, Eva A. Stanton, John Frank Stanton, Kate G. Stanton, Lemuel B. Stanton, Sarah B. Stanton, William F. Stanton, Ann S. Stevens, Arretta Stevens, Elizabeth Stevens, Harriet Stevens, Homer Augustus Stevens, Jennette Stevens, Levy Stevens, B. B. G. Stone, Esther Story, Francis J. Story, Jane Story, John H. Story, Martha T. Story, Mary Story, Robert F. Story, Sarah Story, Elizabeth Strever, Edward Du Bois Stryker, Harriet Du Bois Stryker, Harriet Finch Stryker, Mary Rodgers Stryker, William Du Bois Stryker, William Scudder Stryker, Petrus Stuyvesant, Catheryntje Suylant, Guylben Suylant, Margyrjen Suylant, Caroline Taylor, Julia Teiter, Claes Teunisse, Dirck Teunisse, Arent Tennisson, Ettie Thomas, Joel Thomas, John Thomas, Mary Ann Tuthill, Col. Anthony Van Bergen, Hendrick Van Bergen, Neeltje Van Bergen, Peter Thunisen Van Brunswick, Barant Van Der Poel, Catherine Van Der Poel, Annaetje Van Der Poel, Malgert Van Der Poel, John Van Deusen, Cornelius Van Dyck, Aggie Annet Van Gorden, Henry Van Gorden, O. Van Keuren, William W. Van Loan, Benjamin Van Orden, Catherine Van Orden, Jacob Van Orden, John Van Orden, Capt. Van Schaick, Elizabeth Van Steinburg, Esther Van Valkenberg, Henrick Frans Van Valkenberg, Jennette Van Valkenberg, John Van Vechteu, Samuel Van Vechteu, Michiel Van Vegten, Catherine Van Voorhees, Simon Van Wagenor, Gerrard Van Wagenen, A. B. Van Zandt, Petrus Vas, Abraham Veghte, Renhamy Wagener, John J. Walton, John Ward, Elizabeth Scudder Wardwell, Ellen Josephine Wardwell, Joseph Wardwell, Sara Elizabeth Washburn, Adaline Stanton Waterbury, Cora Alice Waterbury, Judson A. Waterbury, Marvin Waterbury, Sarah Jane Waterbury, Wesley Waterbury, Zopher Weeks, Dirck Wessels, Benjamin Wey, Eldecia Winfield, Capt. Witbeck, William E. Witbeck, Abram S. Wittaker, Benjamin Wittaker, Benjamin Du Bois Wittaker, Catherine Wittaker, Edward Wittaker, Eleanor Wittaker, Emmaline Wittaker, Harriet Rosalia Wittaker, Henry Wittaker, Howard Wittaker, James Wittaker, James Winfield Du Bois Wittaker, Jennie Wittaker, Joel Wittaker, Margaret Wittaker, Margrietje Wittaker, Mary Wittaker, Peter Wittaker, William Wittaker, William E. Wittaker, William Wittaker Jr., Nancy Woodworth, Jane Woolsey, I. N. Wyckoff, Anna Gosman Wynkoop, Gerret Wynkoop, Margaret W. Wynkoop, Peter S. Wynkoop, & Andreas Yersmans. Not all of the names listed above are family names, though the overwhelming majority of them are  some are persons that signed documents, etc. The book has approximately 108 pages and there is an occasional pencil scribble in it where a child made his or her mark. None of the marks obscure any information. There are a couple of annotations by previous owners with updated or amplifying information about the Du Bois family. This is a valuable resource for anyone researching the Du Bois (Dubois) family or any of the allied families listed above. It also may be valuable to anyone researching his or her Indian heritage from tribes located in the New York area in the 1600s. Do not miss the chance to get this great historical, family, and genealogical reference! Please note: This is a scan of the original book converted to Adobe PDF format and written on a CD-ROM. We prefer PayPal for payments. We also accept cash, personal checks, cashier's checks, money orders, or US Postal Money Orders for payment via mail. If you send cash, you do so at your own risk, and must insure you include a note indicating the CD you are buying. Postage is included in the cost indicated below and in the PayPal drop down menu. Payment in U.S. currency only please. If paying by check you must insure the check is drawn in US$. We do not accept postal money orders from International buyers (including Canada). Thanks! How Do I Order a CD? We accept PayPal, Personal Checks, Money Orders, or Cashier’s Checks.